Snow is here! Join us for the AIARE Level 1 Avalanche Education Course! Upon completing this course, students should be able to plan and prepare for travel in avalanche terrain, recognize avalanche terrain, describe a framework for making decisions in avalanche terrain, and apply effective companion rescue techniques. The Avalanche Education course operates with a minimum of six participants and a maximum of 24. The The American Institute of Avalanche Research and Education (AIARE) Course Leader will be John MacKinnon, and the AIARE Instructor will be Joshua Baruch. The number of instructors is based on the number of participants, with a maximum seven to one ratio of students to instructor. Please join us for this Avalanche Safety Course. 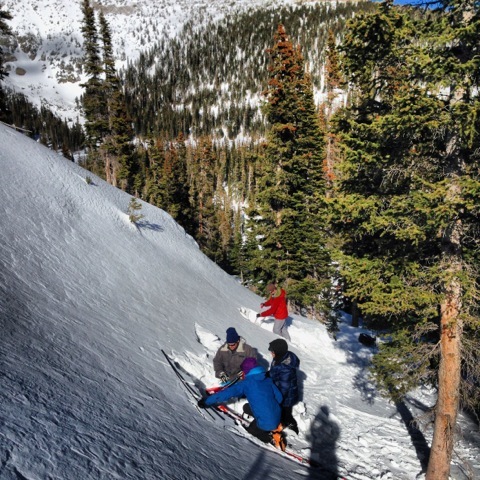 Dates and Times for teh AIARE Avalanche Education : Indoor classes are held Thursday, December 11 and Friday, December 12 from 6:00-10:00 p.m. at CMC Clubhouse in Boulder. Field days, which are either in Rocky Mountain National Park or Roosevelt National Forest, are Saturday, December 13 and Sunday, December 14 from 7:30 a.m. – 4:00 p.m.
Rate: $360 per participant. Please note: Refer a friend who registers and receive a $25 credit for each referral for the course. Included in our rates: All instruction and AIARE course materials for AIARE Level 1 avalanche course. Course materials will be provided the first evening of the class. Not included in our rates: Transportation, meals, personal gear, or avalanche gear (such as beacon, shovel, and probe). A gear list will be sent upon confirmation of the course, and we are happy to help arrange for personal gear if you do not have it. If you would like to purchase personal avalanche gear, please inquire about placing an order through us at a significant discount for course participants. Avalanche Education is so important! Sign up today!